The following intro and exchange of letters forms the dedication to Will Rogers' 1924 book, The Illiterate Digest. 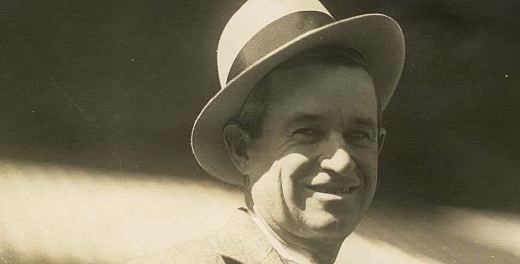 Image of Will Rogers via iCollector. "Most Books have to have an Excuse by some one for the Author, but this is the only Book ever written that has to have an Alibi for the Title, too. About 4 years ago, out in California, I was writing sayings for the Screen and I called it the Illiterate Digest. Well one day up bobs the following letter from this N. Y. Lawyer. It and the answer are absolutely just as they were exchanged at that time. My client, the Funk & Wagnalls Company, publishers of the "Literary Digest" have requested me to write to you in regard to your use of the phrase, "The Illiterate Digest," as a title to a moving picture subject gotten up by you, the consequence of which may have escaped your consideration. For more than two years past it (my client) has placed upon the moving picture screen a short reel subject carrying the title "Topics of the Day," selected from the Press of the World by "The Literary Digest. "This subject has achieved a wide popularity both because of the character and renown of "The Literary Digest" and through the expenditure of much time, effort and money by its owners in presenting the subject to the public. "The Literary Digest" is a publication nearly thirty years old, and from a small beginning has become probably the most influential weekly publication in the world. Its name and the phrase "Topics of the Day" are fully covered by usage as trademarks as well as by registration as such in the United States Patent Office. During several months past your "title," "The Illiterate Digest" has been repeatedly called to our attention and we are told that the prestige of "The Literary Digest" is being lowered by the subject matter of your film as well as by the title of your film because the public naturally confuse the two subjects. We are also told that exhibitors are being misled by the similarity of titles and that some of them install your subject in the expectation that they are securing "The Literary Digest Topics of the Day." It seems to me self-evident that your title would scarcely have been thought of or adopted had it not been for our magazine and for our film. If this were not the case the title which you use would be without significance to the general public. I have advised the publishers that they may proceed against you through the Federal Trade Commission in Washington calling upon you to there defend yourself against the charge of "unfair competition," because of your simulation of their title, or that they can proceed against you, the producers of your film, its distributors and exhibitors in court for an injunction restraining you from use of the title, "The Illiterate Digest." Before, however, instituting any proceedings in either direction they have suggested that I write directly to you to see if your sense of fairness will not cause you to voluntarily withdraw the use of the objectionable title. Unless I hear favorably from you on or before the first of December, I shall conclude that you are not willing to accede to this suggestion and will take such steps as I may deem advisable. When I sent him my answer I read it to some of the Movie Company I was working with at the time and they kept asking me afterwards if I had received an answer. I did not, and I just thought, oh well, there I go and waste a letter on some High Brow Lawyer with no sense of humor. I was sore at myself for writing it. About 6 months later I came back to join the Follies and who should come to call on me but the nicest old Gentleman I had ever met, especially in the law profession. He was the one I had written the letter to, and he had had Photographic Copies made of my letter and had given them around to all his Lawyer friends. So it is to him and his sense of humor, that I dedicate this Volume of deep thought. I might also state that the Literary Digest was broad-minded enough to realize that there was room for both, and I want to thank them for allowing me to announce my Illiteracy publicly."